Manage emotions. Resolve conflict. Improve relationships. Let’s face it. Many of us are not the best communicators when under pressure. The ability to communicate effectively and authentically has become a lost art. Think about a time when you were involved in a high-stakes conversation. Did you go into fight or flight mode…or perhaps you tried to avoid the conversation at all cost? The fact is, that a lack of emotional self-management during high-stakes conversations can lead to damaged relationships and career setbacks. The association between emotional regulation and effective leadership behavior has been well established in scientific literature. When you are emotionally “hijacked” or in a particularly emotional state, there are serious disturbances in the way you process information and the way you retain it. During a high stakes conversation, you are often operating out of the part of the brain called the amygdala — the fight or flight center — which is not conducive to a calm exchange or constructive outcome. The inability to effectively handle high-stakes conversations costs organizations an enormous amount of time and money. By our basic nature, most people have difficulty handling emotionally charged conversations. Our capacity to manage emotions, resolve conflict, and create meaningful alignment with others is not innate — it must be learned. We have been rewarded for results, not emotional intelligence. What is worse than having a high-stakes conversation? It’s not about who wins or loses; it is about coming to alignment with one another. The Meaningful Alignment program was created to help individuals and teams learn how to communicate extraordinarily well — and successfully build high levels of trust. Our research is focused on a concept we call the “Inside Game.” The Inside Game refers to how our beliefs, perceptions, and social behaviors are formed from unique emotional response patterns and coping mechanisms. 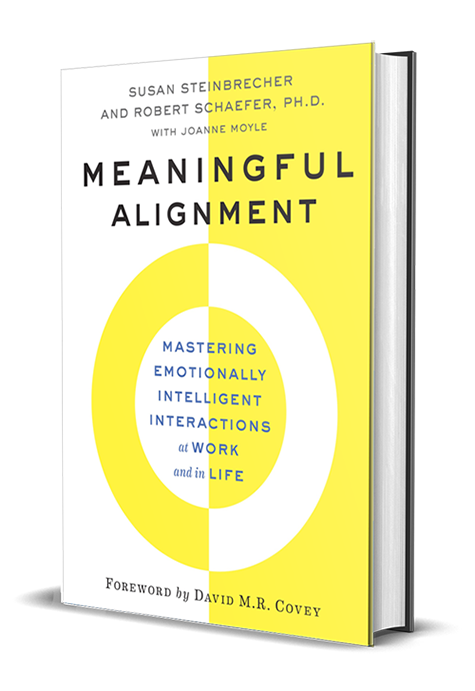 Meaningful Alignment teaches leaders how to model equanimity and be a source of reassurance and confidence – particularly during tumultuous times. Our program offers a unique set of tools and assessments that help you express emotion in a way that will inspire team members through empathy, respect, compassion, and perhaps most importantly, how to offer timely, candid, and courageous feedback.